Abbie Naber, owner and head designer of a.NABERDESIGN , is quickly becoming a household name in the design world. If you haven’t heard of her, chances are you’ve pinned her home designs to your Pinterest boards. We were thrilled to chat with this dance choreographer turned interior designer, mother and professional thrifter to learn about her life, her style and how her home is a perfect reflection of all the above. Lucky for us, she’s just as friendly as she is stylish. 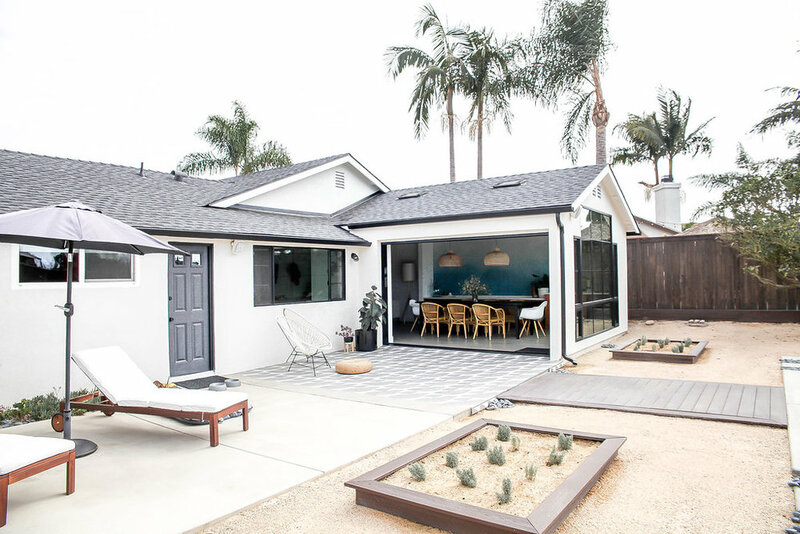 Read on to see how Abbie perfected the balance of style and comfort in her gorgeous San Diego residence. DC: Tell us about a.NABERDESIGN. AN: I run my own interior design and styling business. I also have an online shop where I sell my one-of-a-kind, handmade blankets and pillows. Almost all of the fabric is vintage or up-cycled and it is globally inspired. In addition, I have a handful of unique items such as dog beds and poufs that are also made from vintage fabrics. You’ll also find a section of curated vintage finds as well! DC: Now we know why your home is so amazing! We love showcasing homes that reflect their owner and yours is a perfect example of that. How would you define your style? AN: We travel a lot and I enjoy picking up items along the way when we take trips to other countries. So my home is definitely a mix of styles—I’m a style mutt! My home is mid-century, bohemian, Scandinavian, eclectic and global all wrapped into one! I also love to thrift and vintage shop so our decor is very travel and vintage inspired. DC: We are big proponents of high/low style. Where did you “splurge” in the design of your home and where did you save? AN: I am a fan of high/low style as well! We invested quite a bit into our dining room addition. The large window and sliding pocket doors were an investment but proved to be worth every penny. I love the black windows, the ceiling beams, the glazed brick tile and the ombre wallpaper. It all just came together! I’ve decorated it almost entirely with flea market and thrift finds so that helped balance things out a little bit! AN: I hope that our house conveys the perfect balance between style and comfort. It’s hard to find the perfect balance with both and I’m always debating form over function. I want our space to not get taken over by toys and junk, but still be a place that my family is happy to spend time in. I say comfort as well because if you can’t sit on it, what’s the point? DC: Tell us something people probably don’t know about you. AN: This is super random, but I was on The Amazing Race Season 21. I was also a dance choreographer for over 18 years before making the jump to interiors.